Home » The Staff » Connie, A.B.O., N.C.L.E. 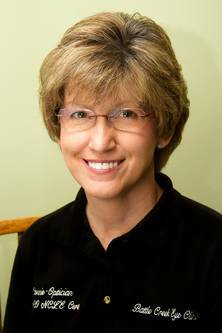 A native of Bronson, Michigan, Connie maintains nationally recognized credentials from the American Board of Opticianry and National Contact Lens Examiners. Connie began her career as an optician in 1981. She chose to work in the optometric industry because she loves the field, loves to help people, and specializes in fitting premium digital progressive lenses. She attended Ferris State University and Western Michigan University. Connie received many academic awards and honors throughout college, while earning her degrees in Opticianry, Business, and Accounting. Connie enjoys spending time with her family, which consists of her husband and their adopted stray cat, Dodger. She also loves fishing, golfing, bowling, doing crafts, going to church, painting with oil paints, and volunteering twice a month at a share center; where she helps feed the homeless and hungry of Battle Creek, many of whom are war veterans.